Foto de stock - Greek Classical Period Bronze Statue of Zeus or Poseidon found in the sea of Cape Artemision of the north Eastern Euboea Island, Greece ... . The God is shown in a great stride about to throw either a trident of a thunderbolt that is now missing from his right hand. The statue is one of the only preserved statues of the preserved style with exquisite rendering of motion & anatomy. 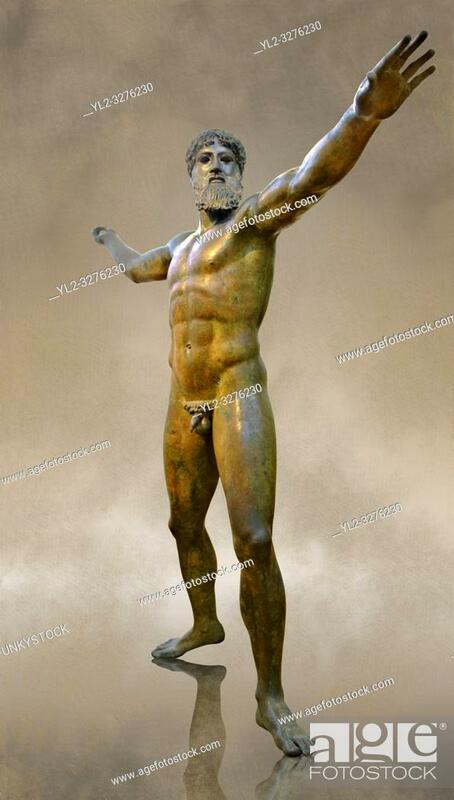 The identity of the statue is controversial and is probably more likely to be Zeus rather than Poseidon. 460 BC Ref No X15161 Athens Archaeological Museum.